"base2Services was Australia’s first company to launch a managed AWS offering, and Australia’s first AWS Advanced Consulting Partner. Built around a ‘devops as a service’ model, base2Services moves workloads to the AWS Cloud, allowing customers to innovate and develop their application landscape using its expertise. Because of base2Services innovative approach, its customers are able to focus on the business knowing base2Services will take care of the management of their IT infrastructure." base2Services are widely recognized as disruptive thinkers with deep service skills and knowledge focused on finding the right solutions to deliver customer’s goals and solve their problems. Seen as an extension to the customer’s team, base2Services works closely with developers and in-house architects to share knowledge and expertise needed to transition customer IT environments – including providing expertise to create an autoscaling, self-healing environment on AWS. Base2Services industry leading expertise extends to providing ‘CI/CD’ tools and enabling repeatable processes – so customers can use AWS as a strategic toolset delivering reduced cost, improved agility, support customer focused innovation and capacity to Go Global in minutes. base2Services has provided insights and expertise for a number of high profile enterprise and public sector customers like carsales.com, THE ICONIC and Emergency Management Victoria. These nationally respected customers – and others - have benefitted from base2Services ability to deliver agile and scalable projects utilising AWS cloud." "We went to Amazon and said, 'Give us your best people'. And they said, 'You don’t want our people, you want base2Services." 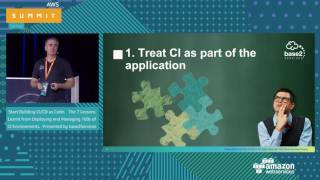 Watch Aaron Walker's presentation from the 2017 AWS Summit Syndey - Start Building CI/CD as Code. The 7 Lessons Learnt from Deploying and Managing 100s of CI Environments. 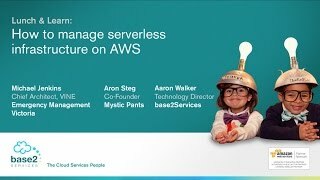 Hear from our customers as they discuss their experiences with managing serverless infrastructure on AWS. 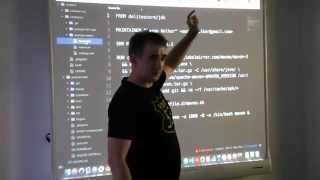 Watch Aaron Walker as he demonstrates how you can use Docker containers to host your build tools, in addition to your infrastructure platforms. Click to view an AWS sample architecture for a web application that follows DevOps principles. "base2Services are widely recognized as disruptive thinkers with deep service skills and knowledge focused on finding the right solutions to deliver customer’s goals and solve their problems." In 2006, base2Services saw the revolution that AWS and cloud computing would bring in scalability and reduced TCO for organisations looking to modernise their infrastructure. We launched Australia’s first managed AWS offering that year to enable our customers to fully benefit from this new technology. We have come a long way since, understanding what works and learning from what doesn’t. Helping our customers with >300 migrations to AWS and supporting 1,000+ application environments means that every one of our customers benefits from the deep knowledge all those years of AWS experience bring. With many first’s in the market, we continue to advance our expertise in a vast range of AWS tools and certifications. AWS offers a staggering amount of products, platforms and services. Sometimes it's tough to know what you need and what you don't. Choosing an architecture that meets your scalability challenges while operating as efficiently as possible needs to be carefully managed. We won't simply lift-and-shift. We use our deep knowledge of AWS to guide our customers in choosing the right architecture for their applications and we develop the infrastructure to allow them to take advantage of what AWS has to offer. We build just-in-time environments that give our customers the ability to create and destroy them on demand to better manage costs and improve the speed of innovation. The result is the creation of cloud-native, auto-scaling, self-healing and repeatable environments founded on advanced CI/CD processes with markedly improved agility. We learnt early on that the project-to-project model doesn't work for cloud services as its short term and narrow focus always negatively impacts the customers business long-term. Instead, we engage in a strategic and long-term vision for your AWS Infrastructure, just like we would if our team was embedded inside your organisation. Our team maintains close relationships with AWS Engineering and Product Leads to ensure our solutions take advantage of the latest improvements and update to AWS services. We constantly refine and improve your solution as the AWS platform matures. Ensuring uptime and efficiency is maximised while looking for opportunities to reduce cost and improve redundancy and failover. AWS lead the world in their mature Serverless (AWS Lambda) and Containerised (AWS ECS) solutions. Serverless and Docker containers represent a huge shift from the typical application development life-cycle. We can guide you in how to take advantage of these powerful AWS services. We've implemented serverless architecture using AWS Lambda, API Gateway and a host of other AWS services. Serverless architectures offer unprecedented ability to scale. However, they are not a one size fits all solutions. Talk to us to discover how serverless could fit into your current architecture. 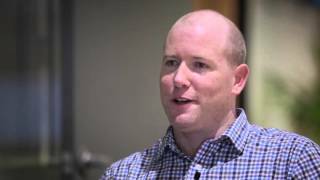 Hear from some of our customers as they share their journey towards serverless architecture in the video below. Docker and containerisation is growing faster than any cloud technology ever seen. We're experts in helping companies move from monolithic apps into Docker optimised micro-services architectures. Utilising a wide range of Docker orchestration tools including Amazon's own ECS (EC2 Container System) we can guide you as to which tool best meets your needs. Hear from our Technology Director, Aaron Walker as he discusses and demonstrates how Docker can be used in your developer workflow for deploying applications.